We bring you original and comprehensive articles, expert interviews, original research, and the news you need to improve your social media marketing. Our large events and training opportunities provide you access to the industry’s top experts so you can remain on the leading edge of social media. In 2009—the midst of the Great Recession—our founder Michael Stelzner noticed that there were a lot of people talking about what they disliked about social media. But few were sharing how businesses could benefit from the emerging platforms. Today, more than 60 million people have benefited from the content produced by Social Media Examiner. Have a look around and see why so many people recommend us. Watch this video for more of our story from our founder. Each month, more than 1 million monthly marketers look forward to our daily original articles from our online magazine. The Social Media Marketing Industry Report is the longest running annual study on how marketers are using social media and what their future plans are. The Creator Monetization Report is a study that explores how bloggers, video creators, and podcasters make money. 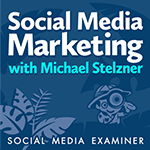 The Social Media Marketing podcast—a top business podcast—is a weekly 45-minute interview show hosted by our founder, Michael Stelzner. Discover how successful businesses employ social media, learn new strategies and tactics, and gain actionable tips to improve your social media marketing. Each week Michael interviews leading marketing experts. The Social Media Marketing Talk Show is a weekly live video show where we review the week’s top news in social media and what it means for marketers. We bring on the experts to help you understand the impact of the latest news. The show is also distributed as an audio podcast. The Journey, an episodic video documentary, reveals the conflict faced by Michael Stelzner, marketer and founder of Social Media Examiner. One one hand, he’s on a seemingly impossible mission to grow his sales by more than 50%. On the other, he’s trying to implement a new business idea that everyone thinks he shouldn’t. Watch how he handles this unique situation. Also, click here to check out our daily Alexa Flash Briefing and our weekly Tweetchat. The industry’s leading physical conference, Social Media Marketing World®, is hosted by Social Media Examiner. It’s the world’s largest social media marketing conference. By attending, you’ll make connections with thousands of social media pros and discover amazing ideas that will transform your social media marketing. The event takes place in San Diego, California. Watch this video from Social Media Marketing World. The Social Media Marketing Society® provides you with the confidence to succeed at your marketing job. Join thousands of your peers and receive ongoing training, support from pros, and access to a community of supportive marketers who understand your struggle. ✅ You’ll develop competence (and confidence) to successfully implement the latest techniques. Each month you’ll discover new, expert-led training. ✅ You’ll gain wisdom, direction, and guidance from working marketers who are eager to support you, so you can make smarter marketing decisions. ✅ You’ll get plugged into a supportive group of other marketers who speak your language and understand your challenges. Writing for us: We are always looking for fresh original social media articles. For more information click here. Spreading the word: Love Social Media Examiner? Share Social Media Examiner with your friends. Purchases: Click here if you need to contact us about a purchase you made. Founder & CEO: Michael Stelzner is the founder of Social Media Examiner, author of the books Launch and Writing White Papers, and the man behind Social Media Marketing World–the industry’s largest conference. He’s also host of the Social Media Marketing podcast, founder of the Social Media Marketing Society, and the central character in The Journey, an episodic documentary. Director of Events: Phil Mershon is the director of events for Social Media Examiner. He brings over 25 years experience in leading customized events, mission-driven campaigns, and creative communication strategies. He now leads Social Media Marketing World. Director of Strategy: Emily Crume is the director of strategy for Social Media Examiner. A consummate networker, she has a track record for architecting strategies that drive business growth. She spent three years at Digg.com helping world-class brands benefit from the social platform. Special thanks: Back in 2009, Michael Stelzner, the site’s founder, had a vision to bring together the brightest minds in social media. Mari Smith, Chris Garrett, Denise Wakeman, Cindy King, Casey Hibbard, and Jason Falls answered the call as founding contributors. We have been provided complimentary services or software from ManyChat, Brand24, Ai-Media, Placeit, OptinMonster, SumoMe, AgoraPulse, Simply Measured, BuzzSumo, ZuumSocial, Social Oomph, GoToWebinar, GoToMeeting, and, Disqus. Shutterstock has allowed us to use their images in some of our older posts at no charge. Copyright notice: Blog posts on our site may not be republished without express written permission of Social Media Examiner. Trademarks: The name Social Media Examiner, the Social Media Examiner avatar, Social Media Marketing World, Social Media Marketing Society, and Social Media Success Summit are registered trademarks and service marks of Social Media Examiner, a California corporation.